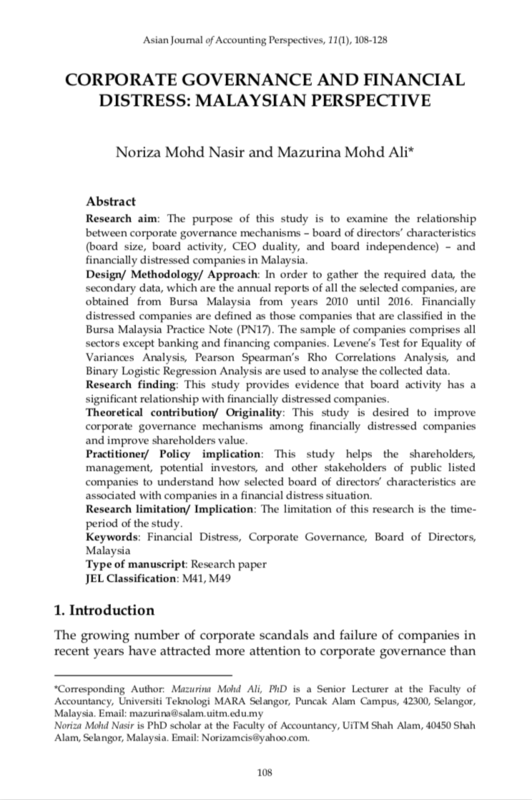 Research aim: The purpose of this study is to examine the relationship between corporate governance mechanisms – board of directors’ characteristics (board size, board activity, CEO duality, and board independence) – and financially distressed companies in Malaysia. Design/ Methodology/ Approach: In order to gather the required data, the secondary data, which are the annual reports of all the selected companies, are obtained from Bursa Malaysia from years 2010 until 2016. Financially distressed companies are defined as those companies that are classified in the Bursa Malaysia Practice Note (PN17). The sample of companies comprises all sectors except banking and financing companies. Levene’s Test for Equality of Variances Analysis, Pearson Spearman’s Rho Correlations Analysis, and Binary Logistic Regression Analysis are used to analyse the collected data. Research finding: This study provides evidence that board activity has a significant relationship with financially distressed companies. Theoretical contribution/ Originality: This study is desired to improve corporate governance mechanisms among financially distressed companies and improve shareholders value. Practitioner/ Policy implication: This study helps the shareholders, management, potential investors, and other stakeholders of public listed companies to understand how selected board of directors’ characteristics are associated with companies in a financial distress situation. Research limitation/ Implication: The limitation of this research is the time-period of the study. MOHD ALI, Mazurina; MOHD NASIR, Noriza. Corporate Governance and Financial Distress: Malaysian Perspective. Asian Journal of Accounting Perspectives, [S.l. ], v. 11, n. 1, p. 108-128, aug. 2018. ISSN 0128-0384. Available at: <https://ajap.um.edu.my/article/view/13417>. Date accessed: 20 apr. 2019.